Are you looking into purchasing hearing aids? If so, it can seem overwhelming at first. There are countless choices out there, and the perplexing terminology doesn’t help. That’s why we’re going to make clear the most common and significant terms, so when you talk with your hearing professional you’ll be well prepared to find the best hearing aid for you. High-frequency hearing loss – this is the most prevalent type of hearing loss. Patients with high-frequency hearing loss have the most trouble hearing higher frequency sounds, such as the sounds of speech. Sensorineural hearing loss – this type of hearing loss develops when there is injury to the nerve cells of the inner ear. This is the most prevalent form of permanent hearing loss triggered by direct exposure to loud noise, the aging process, genetics, or other medical ailments. Bilateral hearing loss – hearing loss in both ears, which may be symmetrical (the equivalent degree of loss in both ears) or asymmetrical (varied levels of loss in each ear). Bilateral hearing loss is ordinarily best treated with two hearing aids. Audiogram – the chart which provides a visual description of your hearing exam results. The vertical axis measures decibels (volume) and the horizontal axis measures frequencies (pitch). 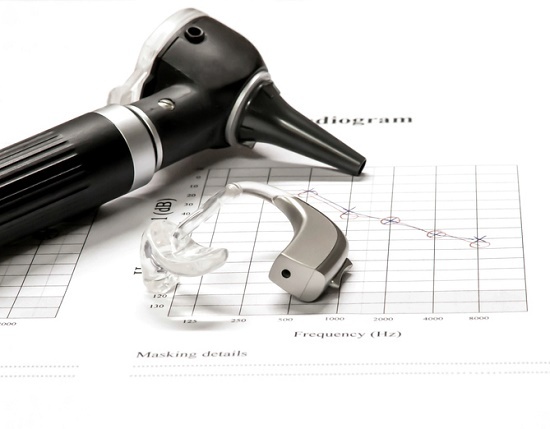 The hearing professional captures the lowest decibel level that you can hear at each frequency. If you require higher volumes to hear higher frequencies, your audiogram will show a pattern of high-frequency hearing loss. Decibel (dB) – the unit utilized to measure sound level or strength. Regular conversation registers at approximately 60 decibels, and continuous direct exposure to any sound in excess of 80 decibels could cause permanent hearing loss. Since the scale is logarithmic, an increase of 6-10 decibels doubles the volume of the sound. Frequency – represents pitch as measured in hertz. Think of moving up the keys on a piano, from left to right (low-frequency/pitch to high-frequency/pitch). Threshold of hearing – The lowest decibel level that can be perceived at each individual frequency. Degree of hearing loss – Hearing loss is classed as mild (26-40 dB loss), moderate (41-55), severe (71-90), or profound (91+). Tinnitus – a prolonged ringing or buzzing in the ears when no external sound is present. Generally a sign of hearing injury or loss. Digital hearing aid – hearing aids that include a digital microchip, used to custom-program the hearing aids to match each individual’s unique hearing loss. Hearing aid style – the type of hearing aid specified by its size and position relative to the ear. Main styles include behind-the-ear, in-the-ear, and in-the-canal. Behind the ear (BTE) hearing aids – the majority of hearing aid components are enclosed within a case that fits behind the ear, connected to an earmold by a clear plastic tube. Mini-BTE hearing aids are also available. In the ear (ITE) hearing aids – the hearing aid components are contained within a case that fits in the exterior part of the ear. In the canal (ITC) hearing aids – the hearing aid components are contained in a case that fits within the ear canal. Completely-in-the-canal (CIC) hearing aids are also obtainable that are virtually invisible when worn. Earmold – a piece of plastic, acrylic, or other pliable material that is shaped to the contours of the individual’s ears, utilized for the fitting of hearing aids. Microphone – the hearing aid part that picks up sound in the environment and converts the sound waves into an electrical signal. Digital signal processor – a special microprocessor inside a hearing aid that can adjust and enhance sound. Amplifier – the part of the hearing aid that increases the volume of sound. Speaker – the hearing aid component that supplies the enhanced sound to the ear. Wireless antenna – available in certain hearing aids, permitting wireless connection to compatible equipment such as phones and music players. Variable programming – hearing aid programming that enables the individual to adjust sound settings according to the environment (e.g. at home versus in a busy restaurant). Directional microphones – microphones that can focus on sound coming from a specific location while reducing background noise. Telecoils – a coil installed inside of the hearing aid that allows it to connect to wireless signals originating from telephones, assistive listening devices, and hearing loops installed in public venues. Noise reduction – functionality that helps the hearing aid to distinguish speech sounds from background noise, resulting in the augmentation of speech and the inhibition of disruptive noise. Bluetooth technology – permits the hearing aid to connect wirelessly with a variety of devices, including mobile devices, computers, MP3 players, and other compatible products. Uncertain of which features you need, or which you could live without? Let us help you find the ideal hearing aid for your unique needs. Give us a call today!